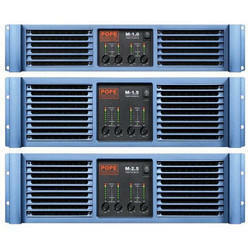 Prominent & Leading Manufacturer from Hyderabad, we offer pope professionals ca-8150 is a 8- channel pa amplifier, power amplifiers, pope w-4 multi purpose speaker, power amplifier and eight channel high performance amplifier platform. with 8 gain controls for easy access, 8 mute-switches and the main switch. The LED informs about the condition of the amplifier. The rear side shows 8 input-connectors and 8 output-connectors. The input sensivity (gain) is 32 dB each channel. The outputs offer barrier strip connectors. The CA-8150 can be used also in half-bridged mode (4 x 400 watts RMS / 4 ohms). The CA-8150 can be switched into three different operation modes: stereo, parallel and bridge mode. The independent limiters can be switched on or off. All models are equipped with a switch-on delay to protect the connected speakers. 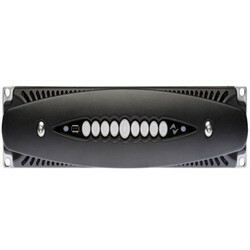 The CA Series amplifier can drive 4-8 ohm or 70/100 volt loudspeakers. 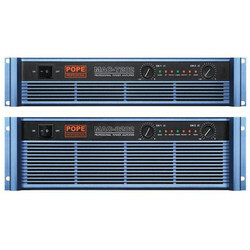 POPE MAC Series Power Amplifiers can use stadium, dance hall, concerts and touring live performances. POPE W-4 multi-purpose speqker ( particularly suitable as a near field main loudspeaker or as a fill/delay element in larger systems, with wide angle projection making for easy audience coverage.) 50 Watts Continuous. Pink Noise, 100 Watts Program , 200 Watts Peak. The POPE Professional® W Series compact multi-use loudspeaker specifically outfitted to serve in a variety of portable and permanent applications. The asymmetric enclosure provides typical angles needed for ceiling and wall mounting as well as for stage monitor operation. It is particularly suitable as a near field main loudspeaker or as a fill/delay element in larger systems, with wide angle projection making for easy audience coverage. The POPE Professional® W Series loudspeakers are high power vented system. This system is designed for near field applications in distributed sound reproduction or reinforcement. The system is based on 4.5” full range, 8”, 10”, 12” & 15” drivers with temperature resistance high frequency Neodymium compression driver coupled to horn with a nominal coverage of 90°x40° (HxV). 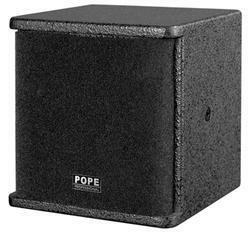 The POPE Professional® W Series enclosure designed to bring compact vented system and smallest of the full range speaker product line. The system engineered for near field applications in distributed sound reinforcement. POPE Professional - M Series Power Amplifier is a range of 4 channel, high output Audio amplifiers. POWERSOFT X8=Eight channel high performance amplifier platform Channel Handling Number of output channels 8 mono, bridgeable per ch. pair. Dante™* 16 (2x RJ45) * DANTE version only. Looking for P A Amplifier ?